The pirate ships set back out to sea Saturday night. The festivities of Gasparilla ended with a fairly low number of arrests. Final numbers came in Monday morning. Tampa Police reported just two felony arrests and 23 misdemeanor busts, plus one citation. It seems the stepped up security helped make this year's pirate parade an enjoyable and safe one. "I've never seen anything like that. The invasion was awesome. The parade was awesome. It was fun. we're kind of in a land locked state so seeing that many boats in the same place at one time. Pretty cool, pretty amazing," said the Beckstrom family, visiting from Colorado. "Love all the beads and all these people who come out that you just drink and have fun," said parade goer Courtney Green. More than a thousand Tampa police officers and 21 other agencies kept close watch for underage drinking and any security threats from every corner. Long-time parade veteran Dennis Wright took notice and appreciates the efforts to make it a fun event for every mate on deck. "None of the police or anything are bothering the parade goers and stuff so they've been just making you feel safe," said Wright. But driving around the events was not as pleasant as the parade. His day started before 3 a.m. Saturday, and he'll keep making circles through downtown Tampa into the late night. "I just don't have enough cabs to cover all the people, you know. It's hard. It's very hard. But you know you do what you've got to do and hopefully keep everybody safe," said Perotta. 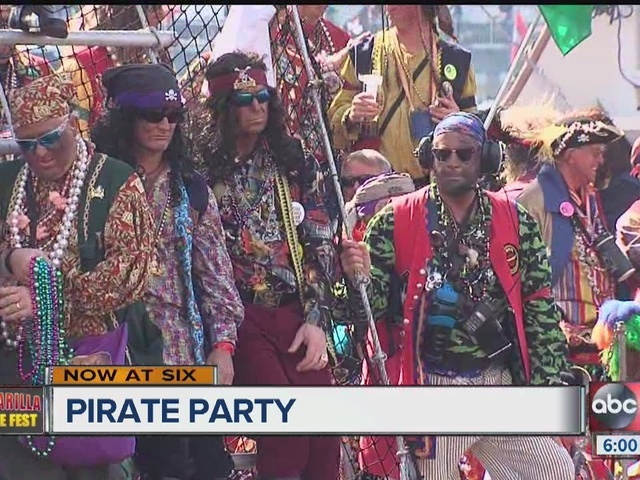 Tampa Police say the parade went without any major incidents, and despite traffic tie-ups in the evening, most visitors say the pirate festival was picture perfect. "You've just got to be patient and relax, enjoy the scenery and enjoy being a pirate for a day," said the Beckstrom family. Clean up crews were hard at work removing the mess left behind, and a big post-pirate party effort helped clear the mess Sunday morning.